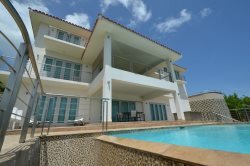 Beautiful 4 Bedroom Ocean View Villa with Pool! This cozy villa is a 4-level home with four bedrooms and 4.5 bathrooms; sun roof terrace and dipping pool; living room with dining area; kitchen with European cabinets, granite counter tops & stainless steel appliances; and spectacular ocean views. The villa has multiple balconies and terraces and is just a 4 minute walk to a quiet beach cove.